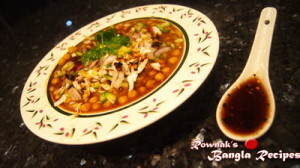 Chotpoti is basically spicy peas and potato mix along with tamarind water. I posted easy and health version before. This one is handy and more taste to me. Other reason to post recipe again, in Australian white dry peas was not available before. I found dry white peas in local grocery shop, so I feel like rephrase Chotpot recipe again. I found this style is handier. Please don’t forget to join my facebook group or like my facebook page to keep in touch with me .Thanks. 1. Soak dried peas at least 4 hours or overnight and wash well. 2. Cut potato in middle and wash it. 3. 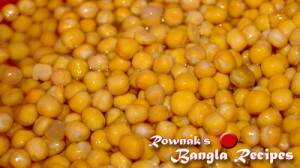 Boil peas and potato together with turmeric and 2 teaspoon salt till it becomes tender (I prefer to use pressure cooker to boil peas, less time consumes). 4. Soak tamarind half hour with one cup water. 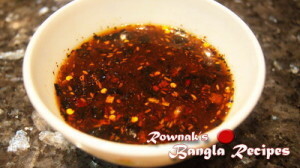 Crush the roasted dry chillies and add crushed chillies, salt, cumin powder and sugar in tamarind water. 5. Mash boiled potato and mix with boiled peas. 6. Heat oil and fry sliced onion till it becomes soft. 7. Add ginger, garlic, chilli powder, chat masala and cook it oil is separated. Add boiled potato and peas mix in it. 8. Add water if needed and cook till it becomes thick gravy or becomes your desire thickness. 9. Take a serving bowl and serve pea and potato mix with 1 chopped egg, cucumber, chilli, onion, 2 fuska crushed and tamarind water. 10. 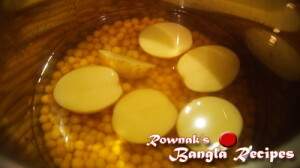 Enjoy awesome taste of homemade chotpoti.